Information pertaining to choosing, growing and maintaining the hardiest plants, trees and shrubs for central Oregon or other areas of the country that receive extreme climate changes. Plus, recipes, using collectibles in the home and garden, the Oregon Trail, Dutch oven cooking and quilting. 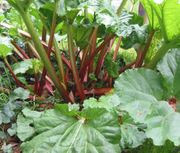 Growing and Harvesting Rhubarb boils down to simple dos and don’t's. Gopher's eating the life out of your trees? ﻿﻿﻿﻿ It happerns every spring, just as the snow melts away from around plants trees and shrubs, the gopher damage starts showing up. Trees are literally being eaten alive ! The Central Oregon Master Gardeners will be presenting their Spring Seminars on Saturday, April 16 at the Deschutes County Fairgrounds in Redmond. They have a full agenda AND on that agenda you will find that from 1pm to 2:30pm I will be speaking on Hardy Perennials for Central Oregon. I'm also including a segment on division of perennials. The cost of each class is $10 or $15 if you register the day of the class. I would love to see lots of you attend these great seminars. This way you can get your gardening fix while you are waiting for the weather to warm up. Just go to http://extension.oregonstate.edu/deschutes/announcement/osu-master-gardener-spring-seminar See you there ! Tulips have great spring blooms. We all get a little anxious for the spring season to begin. Don't believe everything you read in the newspapers or see on television about when to plant. Central Oregon has thousnds of microclimates, and you'll have to adapt your planting methods to your area. To learn more, click here. We have just received a few of the sweetest little greenhouses. They measure 61/2' x 6' x 6'. Very easy to put up and then take down to store for the winter. We put one up here in the nursery for you to take a look at. The cost is $199. To go along with the greenhouse you can also add metal shelving that goes on both sides of the greenhouse for a cost of $149. I think you will really enjoy starting your seeds in this house or growing your tomatoes, etc inside. It has two doors that zipper open and closed, one in front and one in back. It comes with tie downs and metal stakes. Come in and check these out. Foliage diseases can reduce the aesthetic value of aspen, cottonwood and poplar trees. Occasionally, a severe disease outbreak causes premature defoliation or dieback of parts of the tree. 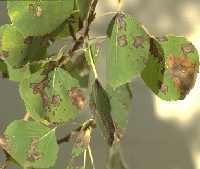 Fungi cause most foliage diseases on aspen, cottonwood and other poplar species. Foliage diseases decrease a tree's aesthetic value and can cause premature defoliation. To reduce future disease problems, rake up and dispose of leaves and prune out branches with cankers.Timely fungicide application can prevent severe outbreaks. If a tree loses its leaves early in the season, it may grow new ones and its health is not seriously affected. If it loses them in midsummer, however growing new leaves may prevent the tree from fully hardening off before cold weather or reduce the amount of stored food. This leads to increased danger of frost damage, reduced growth, and increased risk to other diseases or insects. The fungus Marssonina causes the most common foliage disease on aspen. Marssonina leaf spots are dark brown flecks, often with yellow halos. On severely infected leaves, in wet weather, several spots may fuse to form large black dead patches. Spots also may develop on leaf petioles and succulent new roots. Marssonina survives the winter on fallen leaves that were infected the previous year. With spring and warmer, wet weather, the fungus produces microscopic "seeds" or spores that are carried by the wind and infect emerging leaves. Early infections are rarely serious, but if the weather remains favorable, spores from these infections can cause widespread secondary infection. Heavy secondary infections become visible later in the growing season and cause premature leaf loss on infected trees. Fungicides, if applied early enough can prevent foliage disease. Spraying will prevent only new infections; it will not cure leaves already infected. Trees should be sprayed with a fungicide at bud break and then two or three times during the growing season at 12 to 14 day intervals. Im a 5th generation central Oregonian. I grew up following my Dad around his many gardens. He not only taught me about vegetable gardening, but a love for the many perennials that flourish in our cold climate. I have owned and operated a retail garden center, L & S Gardens, for 20 years. Gardening in an area where summer daytime temperatures might reach 90 degrees and then the evening temperature goes to a chilling 18 degrees has proved to be the biggest challenge of gardening on the High Desert of central Oregon. I have written several books on gardening under these conditions, plus numerous articles for magazines and newspapers. I conduct many seminars from March through May. Once the gardening season begins in earnest I try to stay in the nursery to be available for questions and to assist my customers with their particular gardening needs.